It's the day Phil McBarron reached his 7,000th run from 308 innings and he is also the highest run scorer for Dodgers. An excellent win by Dodgers against strong opposition comprising 11 Asian regular weekend cricketers. Banished to the graveyard pitch D, Capt Carr won the toss and elected to bat. Openers Dollin and McB struggled to lay bat on ball against an opening swing bowling attack exploiting the rather uneven playing surface (the first 3 overs were maidens but no chuntering was to be heard from NJ). Gradually though Dollin found his feet and the tempo picked up and the score progressed beyond 50 at a respectable rate. 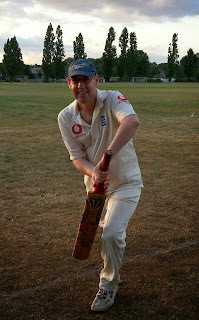 The partnership was ended when McB was rather unluckily dismissed – drilling a non-trademark uppish drive straight at the cover fielder who facing a choice of catching the ball or decapitation opted for the former (unusually this was the only one of 9 Dodgers dismissals not clean bowled). During his innings McB passed the milestone of 7000 career Dodgers runs (DVD gift box sets of all his innings will be sent to Hatteea and Lee for them to enjoy over the long winter months). Dollin was dismissed just short of a well deserved 50 (cleaned up by a good very brisk nip-backer). A number of other Dodgers batters got half starts but it was left to Vijay to provide the main contribution and momentum to the second half of the innings – a well crafted innings of 41 including a towering six over long-on. With Extras contributing usefully a score of 201 for 9 off 35 overs was considered to be a good effort – the consensus being it was around 20 above par given the very long boundaries and uneven nature of the pitch. Prem and NJ who have both played for the oppo were adamant that they were a stronger bowling than batting unit so Dodgers took to the field (after a sumptuous vegetarian sandwich buffet) with a degree of confidence and optimism. Excellent opening bowling from Anis and Vijay put the brakes on from the word go and the run rate climbed quickly. After one of the opening bats retired hurt with a muscle tear, Dodgers claimed wickets at regular intervals including a quite stunning run out of the remaining opener by Prem with a direct hit from the boundary. With half the side dismissed and the run rate climbing towards 10 an over it seemed Dodgers were home and hosed. But some lapses in both bowling and fielding and some controversial partial umpiring in respect of wides (the worst calls including some well-pitched away swingers from Prem and a ball from McB that missed leg stump by a coat of varnish) saw a shift in momentum as well as some acrimonious scenes between various players (think Shakoor Rana and Mike Gatting). A Dodgers loss would have been unjust and some excellent death bowling from NJ and Habib meant 16 were needed off the final over with 1 wicket remaining – the first ball was despatched down the throat of Vijay who took a well judged catch at long-off to seal the victory. Special mention must go to NJ who took another 4 wickets and is closing in on an astonishing 50 wickets for the season (having passed the 100 Dodgers wickets career milestone last week).